To some people, radio may seem like a bit of an outdated medium, but the rise of smartphones has given a whole new meaning to the word. Radio apps let you listen to on-demand shows, livestreams and podcasts, all while adapting their recommendations to your tastes. You can even access FM radio on your smartphone. From the most niche podcasts to the biggest commercial stations - everything is right at your fingertips, so you can spend the rest of your life listening to your favorite radio stations or discovering new ones. Here is our list of the best radio apps you can get for your Android device. Theoretically, you can receive FM radio via your smartphone, although that's becoming harder with the removal of the headphone jack on many smartphones - the plug acts as an antenna, and since USB-C headphones don't have it, they can't perform the same function. Some Android smartphones have a system app that can be operated like a conventional car radio - it searches for stations, will save your favorites, and you can listen with headphones, the internal speaker or via Bluetooth. Unfortunately, radios are a pure receiving medium, so you won't be able to search for specific tracks or skip songs. Also, only a few FM radio apps will allow you to record. If you're interested in these things you'd best go for a web-based app like Audials (see below). If you don't have a radio app installed, getting one can be easily done via the Play Store. Something like Smart Radio FM is clean and simple to use. You can choose your country and then your preferred FM radio station. It's even better than a real FM Radio as it lets you access regional stations that you otherwise wouldn't be able to. You can browse stations if you are not sure what you are looking for and even favorite your most listened to station in your favorites list. The app itself is very well designed, so it leaves a good first impression in terms of its functionality. The main selling point is the range of radio stations and settings it includes, as this is excellent. This radio fan managed to put together a list of his favorite songs within a few minutes. According to the developer, there are over 80,000 stations available and, as you would expect, includes numerous podcasts and recordings of interesting radio programs. If you want you can also transfer your music from Audials via Chromecast to your TV. Another added bonus is that you can record and save music without having to worry about copyright issues. This data can be transferred to an SD card. Audials can also be used on the PC . In the Pro version, you can record pieces of music automatically and create large collections of your favorite hits. You'll be able to listen to this offline. We'll be able to show how to do this after we've completed a more detailed test. The official BBC iPlayer Radio app does exactly what it says on the tin. It delivers all of your favorite BBC Radio Stations from the UK and the World Service, including the ever-excellent Six Music and the engaging BBC Radio 4. You can also use the Catch Up feature to listen to shows again or ones you may have missed. The video and audio clips of live performances are also a highlight. Radio is not only for listening to music! It can also be one of the best sources of news. This is why we couldn't skip the NPR (National Public Radio) Android app - NPR One. It allows you to listen to stories, podcasts and more, both from your local radio station, and NPR itself. The interface of the app is minimalist and easy to use, with the ability to pause, skip and share news. The radio app also adapts to your preferences over time, selecting stories relevant to your interests. However, top news of the day will always be present, so you can stay informed. 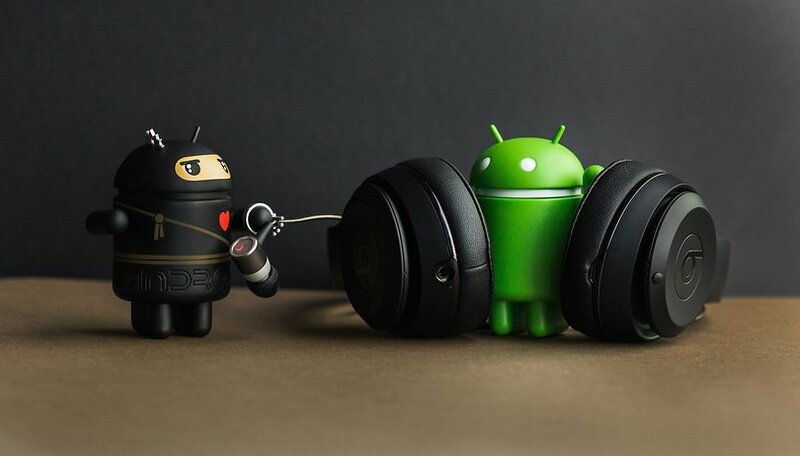 The best part, however, is that you can listen to any content on the go without having to reach for your smartphone, thanks to compatibility with Android Auto and Wear OS. NPR One is one of the best Android radio apps for news, so if you're hungry for informative content grab it for free on Google Play. We can also highly recommend the open-source app RadioDroid, which is available in the Play Store. Even if the app doesn't win any prizes for its design, the app stands out thanks to its elaborate layout and great functionality. The app database is based on information available from www.radio-browser.info, a kind of wiki source for radio stations. Radio stations from all over the world are listed with key words. Through tags like 320 kbps you will find high-quality recordings, or select 30s or 40s for the decade of your choice. A tip on tags leads you to the list with the corresponding search results. You can also record programs and listen to them later, even if you have no reception. Your data consumption is constantly displayed to you and you have the option to open the streams in an external player. Unfortunately you can not enlarge the buffer; the smallest fluctuations in the connection quality are punished with a misfire. RadioDroid is immune to the power saving features of Android. Also using Android Nougat on Pixel the app and thus the playback continued to operate in the background. If you do not want to focus on a specific genre or band, the free radio app Dash Radio is perfect for you. Here the Android user is the spoiled for choice and can choose from over 60 radio stations for their personal radio station playlist. There are also rock stations, radio stations that play only hip-hop as well as pure talkback. The overall music selection is very good, as the radio stations include new hits as well as real classics (Beatles, The Who, Rolling Stones). There are also regularly special releases, where well-known DJs will design a special broadcast program. The Radio-App Dash Radio is therefore especially recommended for anyone who has a desire for several musical genres and are always on the lookout for new hits. This one is a little left-field but just trust me, it’s one of the most unique radio apps on the market today. Loffee is all about lo-fi music to drink coffee too (you can see what they did there with the name…) but it is popular with students who want something chill to have on while they study. It's also great if you are in the gym, or cleaning your apartment on a Sunday - which is when I listen to it. The interface is clean a simple, just like the music. There are ads, though. Tuneln Radio will satisfy nearly everyone's musical tastes. With over 100,000 radio stations available from around the world, it would be hard not to cover almost every genre. So, if you are interested in BBC radio programs, or want to know what is really important in the US, just take a look at the Tuneln Radio. There's not only rock, pop or classical music, Android users will also find various sports programs, cultural pieces, discussions and much more. The radio app is not only available for Android smartphone and tablet, you can also access it with Android Wear devices as well as through Google Chromecast. Do you like rock, reggae and techno, but you're too lazy to look for new artists and bands? No problem, because Last.fm has been designed to evaluates your music tastes, which you have already created at Spotify, Deezer and Google Play and recommends new music for you. Last.fm provides very good results overall and helps you to identify the latest trends and artists you may not yet know. The app is easy to use and everything is clearly set out for you. Anyone who reviews and submits a recommendation will in turn receive recommendations from Last.fm to suit their personal music tastes. Radio FM comes highly recommended for all the music lovers out there who want things clear and easy. Here again you have a wide variety of radio stations from all over the world to choose from, which are all set out very clearly. You can quickly add your favorite radio stations into your list and, just as quickly, switch between stations. The app also offers a wide range of settings to customize your list according to your own preferences, and even includes a sleep function. Rock Radio offers more than 30 channels of pure, unadulterated rock riffs and filthy bass lines. This is one anyone who has a passion for distorted guitar and winding solos. Rock Radio features tunes in the style of soft rock, alternative rock, classic rock, blue, metal and more. There’s also a premium tier if you don’t want to free yourself from the ads. You can buy a 1-month subscription via an in-app purchase for $7.99. Music is all about exploration, and what better way to travel though chords and melodies than with the music from other countries and cultures. World Radio FM lets you listen to radio stations from around the world for free. It’s a very simple, and kind of ugly, app but it does the job and that’s all that matters to some. Do you still listen to live radio, or do you prefer your radio stations to be more personalized? Let us know in the comments, and tell us if we've missed out any of your favorite radio apps. You are doing great work and I Love RADIO FM, 100% FREE. This is a lightweight Android Radio FM application that can work even at low net speed. The application has an easy to use interface, and all the radio stations are all around arranged, in light of various classifications music like shake, pop, traditional and so forth. There are some great apps, you suggested for radio. I am also an app developer if guys want various app related to music please do check my site and if you guys have any suggestion ping in the chat box. My smartphone Mi A1 initially did not had actual frequency based FM radio although hardware support is present. But with Android 9.0 Pie update it was enabled and not Mi A1 is rocking a FM radio. I did a search for *offline fm radio" and ended up here. Just bought a new phone (Blu Studio Selfie 2 running Android 6.0) and it uses the NextRadio app for offline FM radio. NextRadio is *FAR* inferior to the offline FM radio app that came with Androin 5.1 (which at least worked). Can anyone recommend an app to listen to local FM radio stations offline? I'm using FH radio for a while. It's good one. Tune in Radio has been my go-to music app since my HTC Wing from T-Mobile, in 2007. I love the huge selection-- with ads or without. The only problem I've had is that I paid for the pro version, which was supposed to be a lifetime subscription. Tune-in Radio is now wanting to go to a monthly subscription. Every time I try to login I get a pop-up asking me to sign up to pay monthly. Not sure what my "lifetime subscription" is going to give me. I really like TuneIn as well mainly because its such a simple clean app. It doesnt spam you with a million other features. Greetings radio Land, you should give CvsRadio1 - Reggae Jam a license internet radio with unlimited streaming service online a try. We appreciate your positive support. We claim a worldwide existence. I really don't understand these recommendations. They are ALL very limited. Try Radio FM. With this app YOU choose from almost anywhere in the world. I'm a jazz lover, and WBGO, New Jersey and KCSM San Mateo are 2 of the best stations in the world. But Radio FM gives you ALL the classical stations, ALL the jazz stations, ALL the pop, rock, country, ethnic ...... you name it you can find it. Maybe you can give a try to our new radio app: Replaio. You can find it in Google Play (search for "Replaio"). Some interesting features: pause and rewind while listening to live radio, record and listen at the same time, record simultaneously (a number of radio stations at the same time), plan and automatically record cyclic radio programmes and many more. Thank you Buck, this heads up is appreciated as a lot of us do pay attention to what kinds of ethics companies have that we give our hard earned money to. I just wish everyone would! If you love news radio, one super fast and simple app is 1 Radio News. Just search Google Play for "radio news" where it is normally the top result. The pro version, with more vetted stations from every corner of the world all with English, has the highest rating on Google Play of any radio app at 4.8. You missed Mad Genius Radio! This is the best, most customizable radio app available. Why would it make any difference libby! !